Since as far back as his third feature, 1997’s Ossos, the work of auteur Pedro Costa has frequently explored the troubled Lisbon district of Fontainhas. In a loose trilogy he has chronicled the existential wanderings of impoverished immigrants, most recently in Colossal Youth (2006), which focused on the Cape Verdean Ventura. 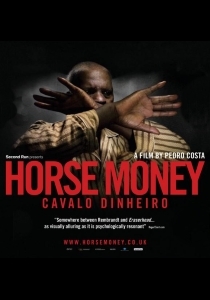 Costa is once again the subject of the director’s latest film, Horse Money (2014), which moves at a brisker pace than previous outings but is unlikely to convert disbelievers. It’s a singular and deeply resonant work that finds a mesmerising poetry amidst the chiaroscuro rubble of post-colonial Portugal and won the Best Director prize at last year’s Locarno Film Festival. As visually arresting and artfully composed as it is narratively elliptical, Ventura’s enthralling journey is more of a series of individual scenes than anything approaching a conventional plot. Like some metaphysical or metaphorical katabasis, it takes Ventura into the dark recesses of both forsaken surroundings and desolate mind. Haunted by spectres from his past, he stumbles through subterranean passageways and shakes uncontrollably through encounters with a doctor, old workmates, and Vitalina (Vitalina Varela). All the while, the Carnation Revolution of 1974 looms invisibly overhead, a long dead star in an otherwise deathly black night. Inky shadows surround much of the action with the expressionist aesthetic particularly striking – though every shot is striking – when Vitalina proffers that Ventura is on a “road to perdition”. No sooner have tears been wiped away than the following scenes recite the sole account of their life together that will outlast her own memory – the notary documents of birth, marriage, and death. The fragility of memory is underscored moments earlier lending an otherwise perfunctory scene tremendous power and poignancy. The spell is utterly unbreakable, building from an opening montage of early 1900s American émigrés in monochrome photographs through to a playful but no less effective scene in which Ventura converses with the apparition of a fallen comrade in a lift. “You’ve broke your body, messed up your head” he’s told at one stage, though it would seem rather to be the work of the whites cracking whips on his back, and the mould in his walls. It becomes impossible to know whether events are real or manifestations of the protagonist’s fractured mind – the rational world has long since sailed from these shores. Both past torment and current abandonment are the cause of the dark caverns of Ventura’s mind, but as he staggers through the debris of his old factory, sings songs with ghostly relatives, or recalls a knife wound of decades past, it’s easy to see what Costa considers Horse Money an exorcism of the old construction worker’s demons. Eloquent, mythical and sublime.